Re-reading the original Sherlock Holmes stories. We got a missing child and rich people being naughty in The Priory School. Facts of the case: The story begins with a bang as a Dr. Huxtable (!!!) collapses unconscious at Holmes and Watson’s doorstep. He’s exhausted with worry because a young boy, the son of a rich and powerful duke, has turned up missing from Huxtable’s private school. 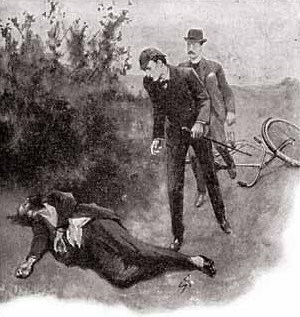 Holmes investigates, finding murder and scandal along the way. 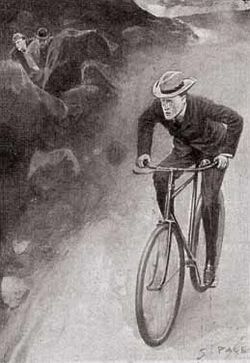 Great detective: Holmes does the tracker thing, with tire tracks and animal tracks in the mud being key to solving the case. 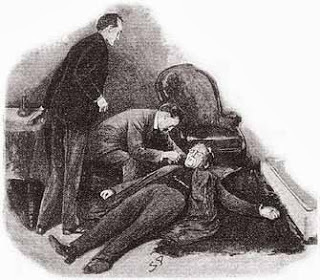 Good doctor: Once again, Watson wakes up in the morning to find Holmes standing over him, fully dressed, saying it’s time to get to work. I don’t care how close these two guys are, that’s just creepy. Action hero: Holmes and Watson face off against Hayes, a smithy, who is described as huge and monstrous. Holmes remains calm and aloof in the face of Hayes’ threats. Yes this is canon: At one point, Holmes stands on Watson’s shoulders to peer into a window. Why couldn’t this have been one of the illustrations? Indubitably: This one shows up on a lot of Sherlock Holmes “best of” lists, but I thought it was more middle-of-the-road. It’s good, but doesn’t really stand out the way my favorites do. Next week: Dost thou want to live deliciously?